Top Jr. Middleweight contender Austin Trout successfully continued his comeback on Tuesday night in scoring an impressive sixth round knockout over veteran contender Joey Hernandez at the Hollywood Palladium in Hollywood, CA. Trout, who was fighting for the fourth time since returning to the ring in August of last year following a decision loss to top contender Erislandy Lara, entered the fight with Hernandez ranked number five in the world by the World Boxing Association (WBA), number seven in the world by the World Boxing Council (WBC), and number four in the world by the International Boxing Federation (IBF). The story of this fight was Trout’s ability to control the tempo of the fight from the outset and use his jab as the focal point of his offense. Trout gradually applied a systematic approach in throwing his jab to the body and head of Hernandez to set up and land crisp combinations. Trout’s superb offense complemented by his equally superb defense as he was able to control distance and slip the majority of Hernandez’ offense. The fight plan executed by Trout worked so well that Hernandez in a clear sign of frustration of not being able to land cleanly on Trout, threw Trout to the canvas with a Mixed Martial Arts (MMA)-style takedown in round four. Hernandez was subsequently penalized one point for the illegal maneuver. Hernandez’ attempt to get under Trout’s skin however, was not successful as Trout continued to execute his fight plan, despite being thrown to the canvas in a manner that could have resulted in him suffering an injury. Trout’s systematic approach would ultimately break Hernandez down as a combination to Hernandez’ body dropped him in the closing seconds of round six. The knockdown would end the evening for Hernandez, who was subsequently counted out by Referee Jack Reiss. Official time of stoppage was 3: 00 of round six. Austin Trout advances to 30-2, with 17 Knockouts. Joey Hernandez falls to 24-4-1, with 14 Knockouts. In all truth and honesty Austin Trout’s performance in this fight was exactly the type of performance that a fighter who is on the comeback trail needs to have as he attempts to reestablish himself as a player in whatever division that fighter chooses to campaign. With four victories under his belt in a little over one year, it will be interesting to see whether Trout will face a top contender in his next fight. It is important to remember that Austin Trout has previously held interim/regular champion status in the WBA’s Jr. Middleweight ratings and maintained that standing for two years between February 2011 and April 2013. The only two fighters to defeat Trout were Saul Alvarez and Erislandy Lara, who are widely regarded as the two best fighters in the division with the exception of Floyd Mayweather, who is still recognized as a unified world champion in the Jr. Middleweight division. It is certainly a possibility that Trout could find himself in position for a rematch against Lara at some point in the near future, especially if Floyd Mayweather were to vacate the WBA Jr. Middleweight world championship. 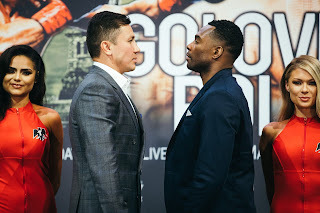 Lara currently holds interim/regular champion status in the WBA’s Jr. Middleweight ratings, which essentially makes him the number one contender to that world championship. As this observer has speculated before it is certainly a possibility that if Mayweather, who will defend his unified WBC/WBA Welterweight world championship against Andre Berto on Saturday night, does indeed decide to retire after that fight as he has stated that Lara could be named world champion by the WBA in the Jr. Middleweight division or at minimum be put into a fight for what would be a vacant world championship. It may be logical to assume that if Mayweather decides to hang up his gloves following his fight with Andre Berto that Trout could be a likely opponent for Lara. If a potential world title shot is not in the immediate future however, it will be interesting to see where Trout will fit into the mix in what is a talented and deep Jr. Middleweight division. Whether or not Austin Trout will find himself back in the world championship picture in the near future remains to be seen. For now however, Trout has done all you can ask of a fighter who is trying to reestablish himself. He has not only been active, but he has looked impressive in the first four fights in his comeback. If Trout is not back in the world championship picture in the immediate future, but can remain active and more importantly if he can continue to win, it will produce the best argument possible for a potential world championship opportunity down the line.